Want scenery? Visit this well-known Missouri State park right near us! Taum Sauk Mountain State Park is located in the Saint Francois Mountains in the Missouri Ozarks. It is positioned around Taum Sauk Mountain, the highest point in the state. At an elevation of 1,772 feet, this is what makes it the highest point in Missouri. The state's highest wet-weather waterfall is a highlight of this scenic rugged park. It has a rustic campground, a paved trail to the highpoint, picnic facilities, and a lookout tower from which a good view can be had; the dense forest with miles of land untouched by civilization. Taum Sauk State Park is in a common jurisdiction with Johnson Shut-Ins State Park, and together they comprise the second largest state park in Missouri. These parks and the adjacent Bell Mountain Wilderness Area are part of a large wilderness area that is very popular with hikers and backpackers and includes the Taum Sauk section of the Ozark Trail. 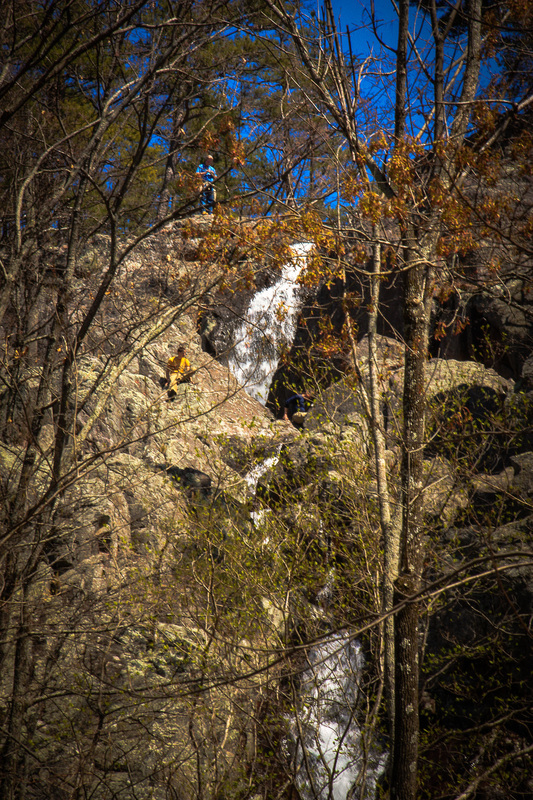 The trail inside the park can travel to Mina Sauk Falls, the highest waterfall in Missouri. The rugged trail makes a three-mile loop from the highpoint parking area. These falls normally have water cascading over them during times of wet weather. The park's 7,500 acres include hickory forests and rocky glades that provide a beautiful, solitary experience for hikers. A series of trails, including a portion of the Ozark Trail, wind through the park's picturesque setting and provide awesome views of the surrounding countryside. The park also has a 12-site basic campground, a special use area for non-profit youth organizations, and a picnic area to relax under the trees. A mile down the Taum Sauk section of the Ozark Trail waits the Devil's Tollgate. This eight-foot wide passage of volcanic rhyolite stretches 50-feet long and 30-feet high on both sides. From here, hikers can continue on the over 10-mile hike to nearby Johnson Shut-Ins State Park. Taum Sauk Mountain in home to untamed wilderness, a range of wildlife, and even Indian legends! This is a place you will definitely want to visit! Read in depth information about Taum Sauk Mountain State Park and find map and directions here.